Caring for the frail elderly is complex. Many factors must be considered when caring for older adults, including the fact that multiple health issues may be present. Nova Scotia has one of the oldest populations in Canada. Many will spend time in a long term care facility. And, the average length of stay in our 93 nursing homes is 2.9 years. There are many dedicated professionals providing care for these residents every day, and now we want to take that one step farther. We know that 13 per cent of residents are taking 10 or more medications on a daily basis. This use of multiple medications can place frail elderly residents at a high risk for adverse reactions which can greatly impact their quality of life. The potential for detrimental effects increases with the number of medications being taken and advancing age. Taking more medications than may be needed is known as polypharmacy. Reducing unnecessary medications can benefit the resident and reduce the risk of unintended adverse drug effects. We have a responsibility to ensure medications are being used appropriately. To do that, a tool kit has been developed to assist health providers in understanding the importance of appropriate prescribing for the frail elderly. The toolkit will provide new information for health providers to ensure ongoing assessments are completed and the medications which are continued are done so safely. Medication management is extremely important, particularly in the frail elderly. This project helps to ensure it’s done well and safely. The toolkit will provide the information health providers to ensure ongoing assessments are provided and medications are continued to be provided safely. Medication management is extremely important, particularly in the frail elderly, this project helps to ensure it's done well and safely. The toolkit is informed by current evidence and the best practice research currently available on the frail elderly. Taking more medications that may be needed is known as polypharmacy. Sometimes, with multiple medications, there can be actions and reactions that can be harmful, particularly to the frail elderly. Why should this be a concern, medications are provided for a reason, why take any away? Sometimes, medications have been prescribed and taken for a long period of time. It's important to look at the whole picture as a person ages, to see what’s best for their safety, and to enhance their quality of life. Isn't this really about saving money? This is about enhancing the quality of life of the frail elderly. Caring for frail elderly is complex, and that’s why this toolkit was developed. Health professionals will have an accessible resource that will help them to determine how best to manage medications among this population. Does this mean medications were provided inappropriately? Not at all. It simply means that circumstances may have changed and multiple medications may not be in the best interests of the patient. Unintended adverse effects can be more harmful with increasing age. For example, we know that 20 per cent of long term care residents are taking 14 or more medications. This project helps health professionals ensure that necessary medications are still provided while avoiding the adverse effects that can cause more harm than good. Shouldn't health professionals have this information anyway, why do they need a toolkit? 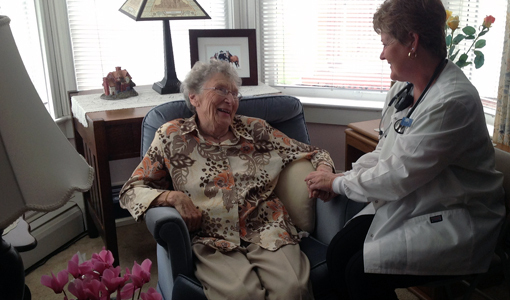 Care for the frail elderly can be complex, especially when multiple health issues are present. It's important that we provide the tools necessary so that health professionals are able to provide the compassionate care they always have.